“In a dark, candlelit club in Madrid, a glass of Spanish red in front of me, my heart skips a beat and then pounds on faster. The commanding spectacle has begun. Clap, slap, stomp: The stage comes alive, the music beautifully haunting, the dance completely captivating, and just like that, I’m transported. I’ve entered the world of flamenco, a Spanish tradition of song and dance that goes back to at least 1774, when it was first mentioned in literature. On Nov. 16, 2010, the United Nations Educational, Scientific and Cultural Organization (UNESCO) declared flamenco one of the Masterpieces of Oral and Intangible Heritage of Humanity. I am humbled by the performance, moved to tears by the sheer power of it. I can’t remember how many performances I saw on that trip to Spain, or how many I have seen since, but I know I was forever enchanted, a goner for this art form, haunting and passionate — nothing is held back. 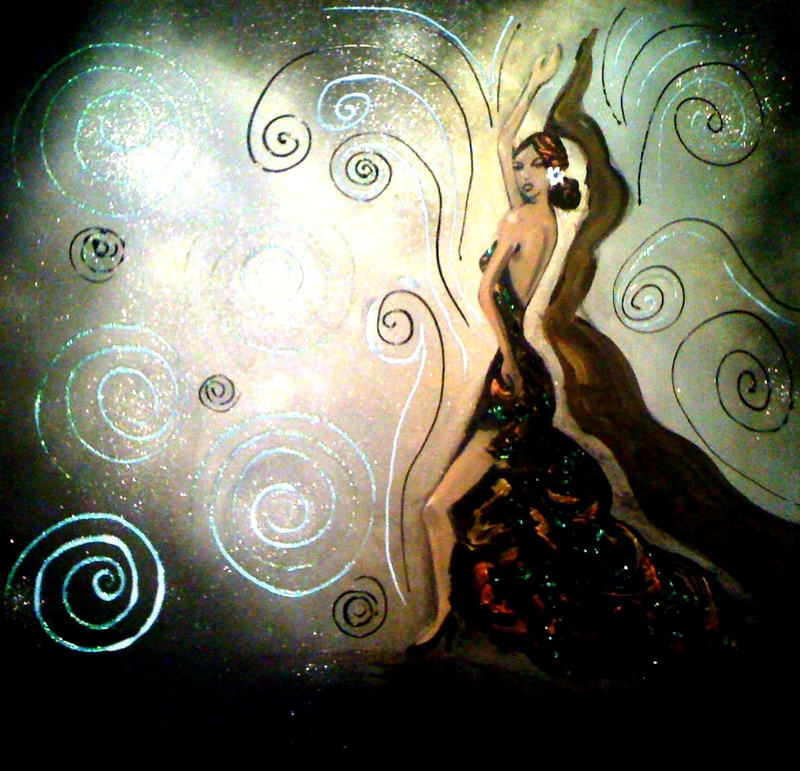 I painted this dance again and again, and would return to it as a subject matter anytime. To purchase Stephanie’s paintings, click here. The story: “Celebration of life is a recurring theme in my work. When giving me advice, my wise mom, on more than one occasion, said, ‘Don’t take life, or yourself, so serious,’ and so in my typical fashion (I cant help myself), I took that seriously. Her words are something I have to work at, and remind myself of. My paintings help me do that: They are reminders to me to focus on celebration and the pure thrill of being alive. “The title of this piece could have been many things: ‘Dancing to the Beat of My Own Drum’ or ‘Dancing Through Life’ or ‘Without a Care in the World.’ But I chose to put her in the vineyard, tying her to another theme in my work, which is wine country — another place for joyous celebration. ‘Dancing through the Vines’ is meant to remind us all of my mom’s sage advice: ‘Don’t take life or yourself, too seriously.’ Remember to take time to celebrate, to honor your own aliveness and the special people in your life. ‘She is created in acrylic, and her body has been collaged from my palette. I paint on a plastic that you can peel your paint off. The more interesting leftover paint — or acrylic skins, as they are called — end up as collage in my work, as it does here. The wine label is also a skin. 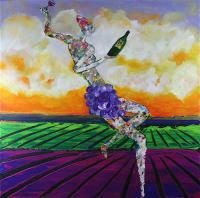 To purchase this painting, visit the Michigan By The Bottle Tasting Room. To purchase other paintings, click here.